Nick Silverio W’18. Photo by Jason Lau. Wharton student Nick Silverio discovered dance at age 2 when he hopped on the family coffee table and performed an impromptu routine to “Greased Lightnin’.” Seventeen years later, he’s still dancing—only now his stages are much larger. Silverio appeared on the current season of FOX’s So You Think You Can Dance in the Philadelphia auditions and Los Angeles callbacks episodes that aired last month. Signed by Clear Talent Group in May, he’s currently auditioning for Broadway musicals, live TV shows and commercial work. We spoke with Silverio about his reality-TV experience and his passions for dance, Penn, and Arts House Dance Company. 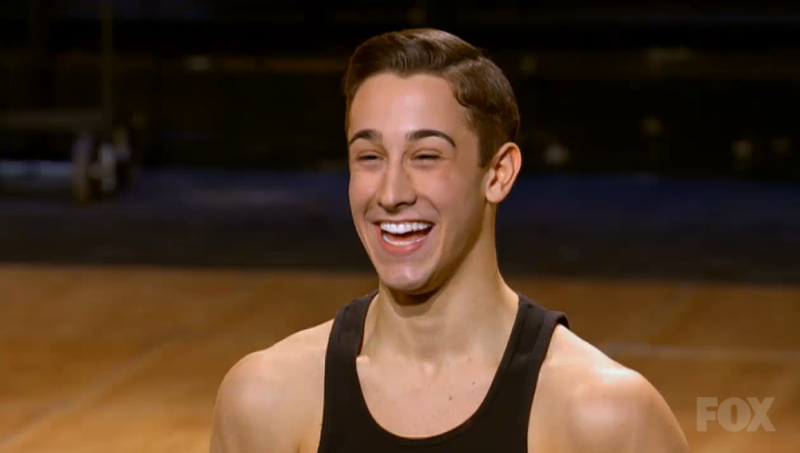 Tell me about competing on So You Think You Can Dance. The process was really interesting. People say the show’s only based on looks or yada yada. Really, it’s based on everything. The dancing caliber you have to get to just to make it through the first few rounds—I really didn’t expect it to be that intense. But there’s definitely a level of casting. They’re looking for characters and certain types, for sure. I think, as with any reality show, they want a good, well-rounded cast. I saw you several times in the Philadelphia auditions episode. How long did they have you dancing in front of the LOVE statue to get that clip? I was there from 9 a.m. to 2 p.m. I missed French class and my writing seminar that day. We were there for so long that I got a sunburn. And I was shown once. And I was so excited to be shown once from that shoot. You do so much filming, but you’re really lucky if you’re just shown for a second. What happened when you flew out to LA for the callbacks episode? It was kind of insane. There were 150 people there for callbacks and you’re filmed 24/7. The moment you get out of your hotel room, you are on camera. At breakfast people are doing tilts and legs when they’re getting their eggs. They’re doing pirouettes and getting fruit. You have to have tons of energy and tons of personality at all times—even at 5:30 in the morning. I went through rounds of choreography and ended up not making Top 20. But what I did get to do was amazing. When I didn’t make it, people around me were crying, but I was like, I’m just really excited to go back to Penn. I knew it just wasn’t my time, and that’s okay, because I felt like I did my best. I can say that I wasn’t actually cut for a reason. They literally called my name and said thank you. That’s all you get, and that’s okay. Do you think you’ll audition for the show again, or is there some rule against that? I would audition, but I will be shocked if they have another season. I really hope they do, but they’re really fighting for viewership this year. How did you decide on Penn for college? My senior year, I didn’t know what to do with my life. I wanted to dance and I also knew I really loved school. I was a huge nerd and by was I mean am. I was looking into dance schools as well as business schools. I truthfully never thought I’d get into Wharton. When I did, I took it as a sign that this is the path I should be taking. Also, Penn has Arts House Dance Company. Without Arts House, there’s a very good chance I’d be at NYU right now. When I heard about Arts House and did some research, I found out they’re pretty incredible. We have dancers from all over the country—everyone from prima ballerinas to gymnasts to tappers—and they’re all brilliant. The fact that I got to continue my dance education with Arts House was the reason I went to Penn. Now that you’re signed with Clear Talent Group, how will you balance auditions and casting calls with classes? I’m taking a gap year from Penn, but I’m 100 percent coming back. I will be getting my degree from Wharton. I love it at Penn. It really is my second home. I already miss it a lot. I’m moving to New York on August 22, but I’ll be back at Penn three days later for Arts House auditions. I’m also a management TA for MGMT 100, so although I won’t be TAing this year, I’m still involved with that as well. Is there a type of dance you specialize in? Was it hard to often be the only guy in dance class growing up? It was difficult, but never in dance. When I was 10, most boys my age were playing soccer and baseball and video games. Those things never really interested me because I loved dance, I loved performing on the stage. I definitely was bullied, for sure. But I was lucky as well because I’m from Massachusetts, which is probably the most liberal state in country. When I was a senior in high school, I was awarded Outstanding Youth of Shrewsbury for that year. Apparently people in my community saw me as inspiring. I never knew that just me being myself and being confident in myself would impact others. To this day, sometimes people message me on Facebook and say, ‘You don’t really know me, but I wanted to let you know that I’m so inspired by who you are because you stick to who you are and don’t let anyone bring you down.’ I’m always blown away because I never knew I had that sort of impact on people.